Chronicling the life of our sweet baby Jax. Please help us out! Jax is in the Parents Cover Contest and needs your vote. If I must, I'll get on my hands and knees and beg. Thanks! 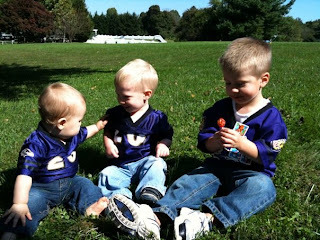 Facepainting & Trains: "Vote for your favorite kids in the Parents Cover Contest! One Reader's Choice Winner will be a finalist at the Professional Cover Shoot! Enter your own child today at http://www.parents.com/enternow !" I love this article on how to photograph Christmas. For anyone interested in capturing the special moments of the holiday season, this is a must read and a crash-course in some indoor camera tricks. Iron Man... Teacher of the Year?? Yes, it's an Iron Man board book made especially for little tykes like Jax. We try to find books relating to what Jax is learning in school that week. This week's theme is "friends." 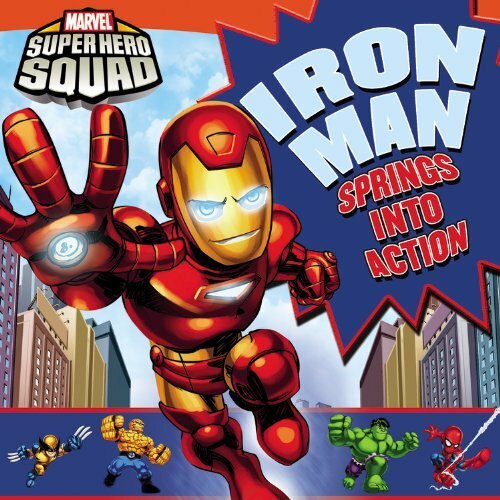 It just so happens that this book is all about Iron Man and his friends. We read it 3 times in a row the first night, it even surpassed the Curious George baseball book that Jax picked out. I am beyond behind getting this post up. However, 2 weeks ago we returned from a super-awesome vacation in Myrtle Beach with the whole Zahn clan. Jax ran around looking for G-G at G-G's house, he just couldn't figure out why she wasn't there. However, the best times for Jax were swinging the golf clubs in the house with Tyler while wearing Great-Grandpa's hat. 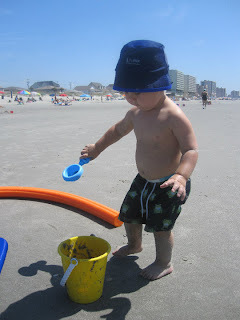 We had tons of fun on the beach. 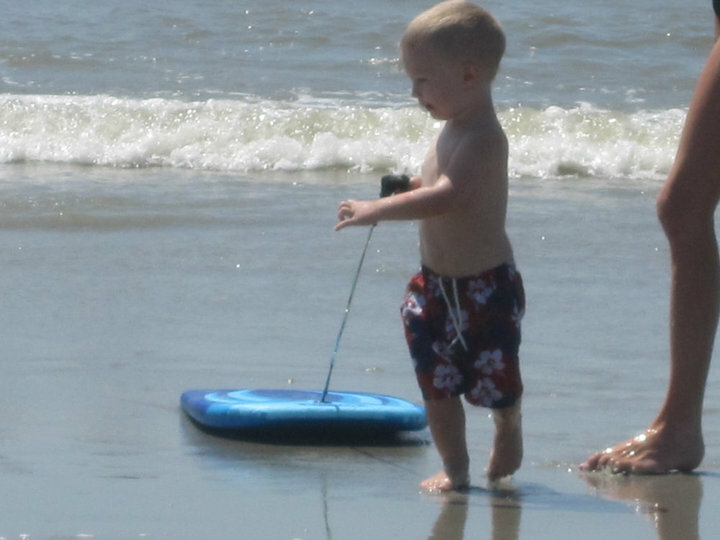 Jax was probably better at the skim board than any of the rest of us. 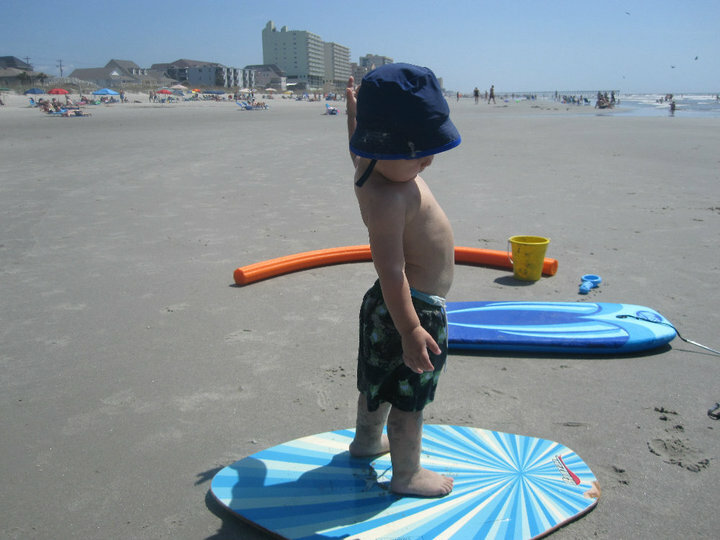 And, he's talented at boogie boarding, too! 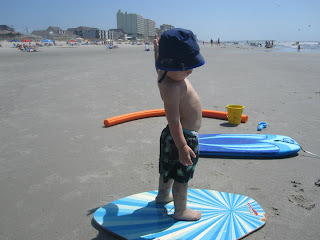 There was lots of boogie boarding done by Jax's bestest buddies, Tyler and Luke, too. There were lots of sandcastles to be built with all of this sand. Good thing there were 3 Zahn boys to do the job! 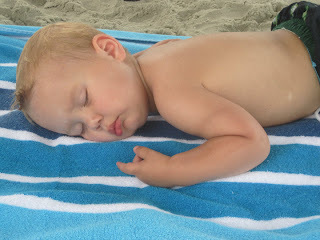 Of course, building sandcastles is VERY tiring work. 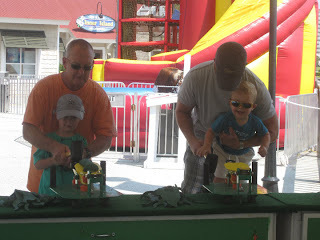 We hung out at Barefoot Landing, and each of the boys got a prize at Frog Bog. 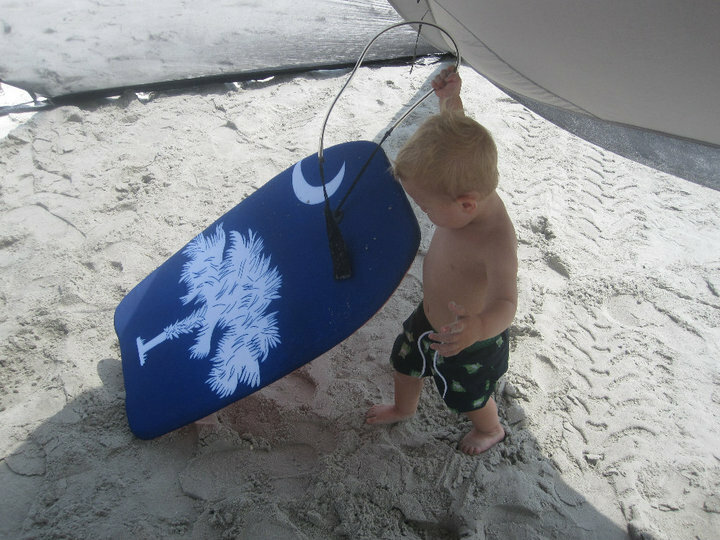 Of course, a little help from Grampy and Daddy never hurts, either. 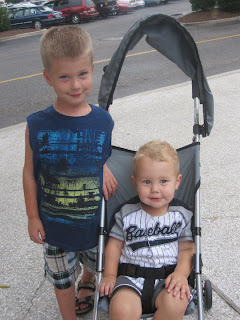 Tyler and Jax posed for a picture at Barefoot Landing before hitting the rides and games..
And, the best part of Barefoot Landing was the merry-go-round!! 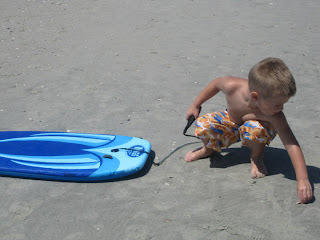 The week was great and Jax learned lots of new tricks over the course of the week. First of all, this was his very first week "sleeping" in a big boy cot. However, very little sleeping ensued. This reminded Jason and I exactly what having a newborn was like. Second, big cousin Tyler taught Jax all about IRON MAN!! And, Jax got his very first Iron Man toy. Now everywhere we go, every possible piece of Iron Man memorabilia is pointed out and begged for. Anyway, appropriately enough that was the same weekend Grandma and Grampa got us skybox tickets at the Frederick Keys game. Oh boy! Jax's dream world - lots of people to flirt and play with, baseball, and food! He even got to try cotton candy for the first time and ride the merry-go-round. 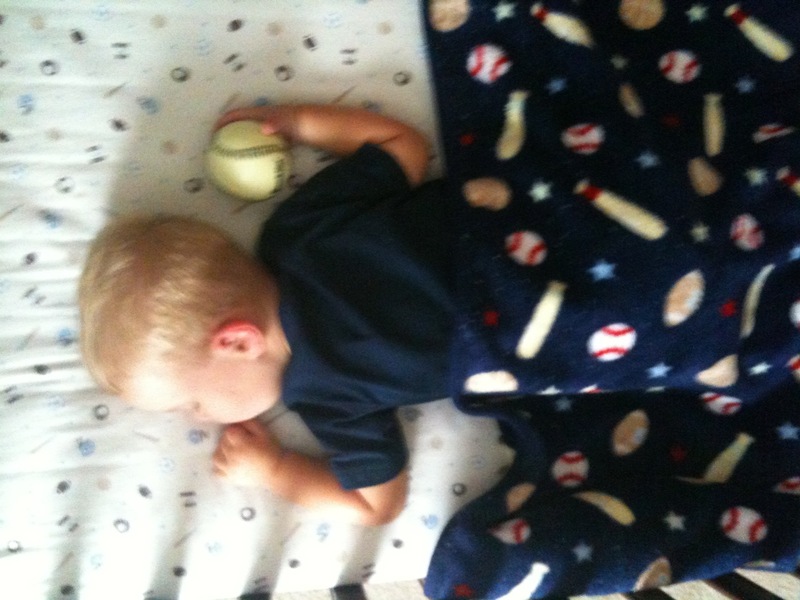 Upon our arrival, Grampa had a new present waiting for him - a new bat and ball. With the exception of the merry-go-round, the bat and ball went everywhere with Jax that night. He was so excited to see the baseball players on the field who also had a bat, just like his!! The merry-go-round was another favorite. He rode it with daddy, mommy, and Grampa. And each time the ride stopped a sad "oh no..." was heard. And finally, Jax met Keyote, the Keys mascot. Everyone held their breath to see if he would be afraid, but he loved him!! They fist-bumped, hugged, and Jax even gave him a kiss on the nose. Be a best friend. Tell the truth. Overuse "I love you." Go to work. Do your best. Don't outsmart your common sense. Never let your praying knees get lazy. And love like crazy. 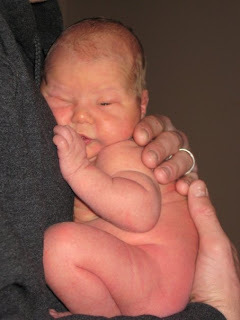 I decided to start a blog (okay, probably more or less a shrine) all about the greatest guy to grace the Earth with his presence, our son, Jackson. Being that the baby book is pretty much filled up with no more blanks, I figured this would be both a great way to keep family and friends updated while chronicling Jax's life. There are too many adorable little moments I never want to forget, and don't want to forget to share with everyone. Thus became The Life of (jackson) Riley. 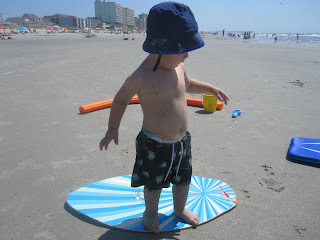 I'll pause a moment for your "awwwww"s. :) He grew up so fast in the past year and it's been quite a fun ride. 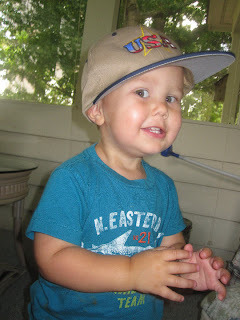 And, call it intuition, we knew from the start he would just love sports like his daddy, mommy, and sports fanatic and trivia guru, Grampa. 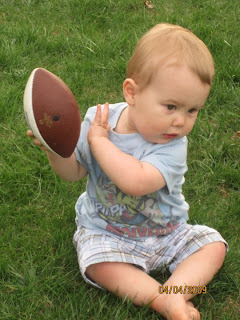 His love of sports has only grown. 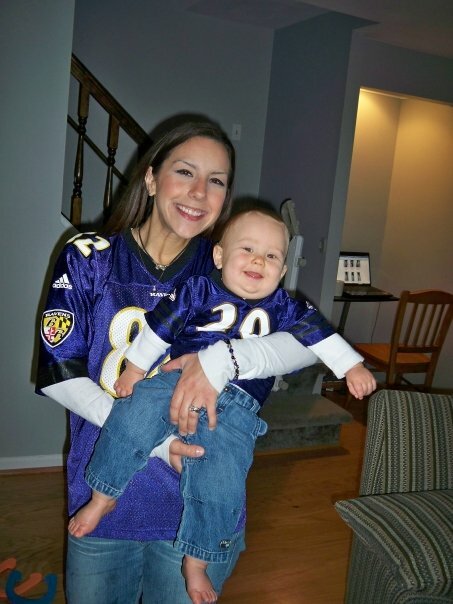 From decorating his room before he was born with baseballs, to his first word ("ball"), and his first touchdown (see the video on The Zahns' YouTube Channel), Jax has been a natural athlete from the start. Now (by 18 months) he is able to name every type of ball, use it in the correct form, and use it well (read: duck or go loooong). 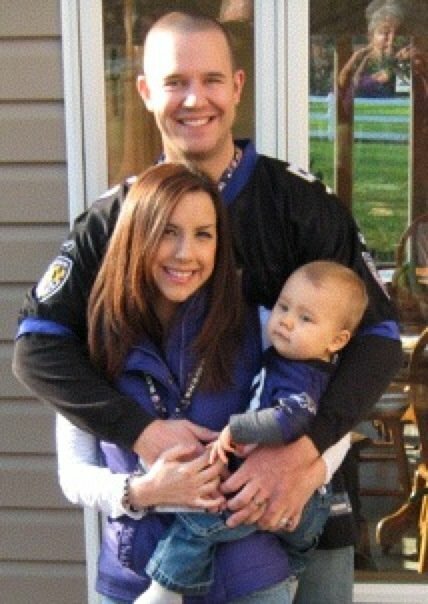 I think the family has come to a consensus that Jax will be a Ravens fan. However, I'm fairly certain Jax will be the center of a few family feuds of college teams as my family is all 100% "Go Terps!" and Jason's family may never have missed a single Mountaineers game - EVER. Another battle that has already ensued is the battle over Jax's baseball team. As a nearly lifelong Red Sox fan (well, since the age of 9) I would like to enact my motherly veto power on this. I thought I had this one in the bag since Uncle Paul bought Jax his first Red Sox blanket and baby hat before he was born and I had a maternity Sox shirt I wore to games when I was pregnant. 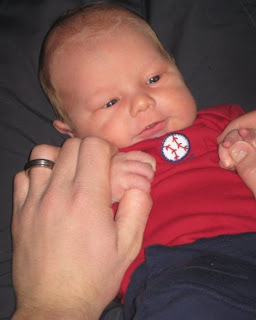 Jax and I have matching Red Sox T-Shirts for this season and there was little to no competition until....WHAM! 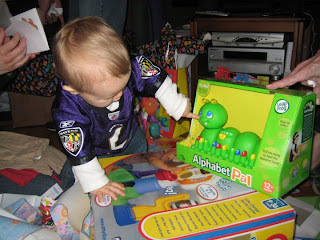 Grampa went and bought an O's jersey for Jax...and an O's baseball. Oh no.... I guess the O's aren't bad (although they really, really are) and that they are no doubt better than Grandma's dumb Yankees. Jax is now swinging his bat like a pro, spiking footballs and even has his own touchdown dance. The road ahead will undoubtedly be fun. Next project: golf. FORE!! PS - Details on the Frederick Keys and O's games (Jax's first games) to follow.. running out of time tonight.